Ok so it’s now the last day of February (we made it!) and I am hoping that we’ve all got our new Christmas gifted calendars up on the fridge. But what about making a more permanent, beautiful home for it …. and for all the calendars in the years to come? 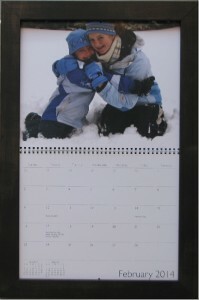 Our client came in with a great calendar of family photographs put together by her daughters through the Apple store. She wanted us to make a frame for it. So off Jimmy went to the wood shop where he made the custom sized frame, routering out a slot at the top for the calendar to slide into. He put a permanent backing on it and we finished it with a dustcover and hanging wire as we normally do. There is no glass so she can still write on her calendar if she wants, but now its more of a work of art…. and it’s definitely not going to hang on her fridge.